Although Henry Aaron (755 career homers) made a career of thrilling Braves fans in historic Atlanta-Fulton County Stadium, he is honored with a statue and other larger-than-life displays at the modern day home of the Atlanta Braves, Turner Field. Fans entering the Grand Entry Plaza located on the north end of the ballpark often stand in awe of a 100-foot diameter photograph of Hank Aaron's actual 715th home run ball, which dominates the Plaza-side scoreboard and provides a popular backdrop for fan photos. 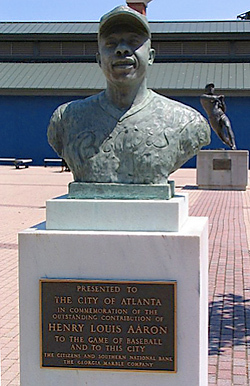 Aaron’s statue, along with those of fellow Atlanta greats Phil Niekro and Ty Cobb, were relocated from Atlanta-Fulton county Stadium to Monument Grove, a large, park-like area adjacent to the Braves ticket windows. The popular public space also features a bust of Hank Aaron. A statue of Aaron also stands outside the front entrance of Miller Park (to commemorate his playing days with the Milwaukee Braves). And a statue of the Aaron as an 18-year-old shortstop stands outside of Carson Park in Eau Claire, Wisconsin, where he played his first season in the Braves' minor league system. In April 1997, a new baseball facility for the AA Mobile Bay Bears constructed in Aaron's hometown of Mobile, Alabama was named Hank Aaron Stadium; and in 2006, a recreational trail in Milwaukee connecting Miller Park with Lake Michigan along the Menomonee River was dedicated as the "Hank Aaron State Trail." Hank Aaron was on hand for the dedication along with Wisconsin Governor Jim Doyle, who at the ceremony described himself as a boyhood fan of Aaron's.